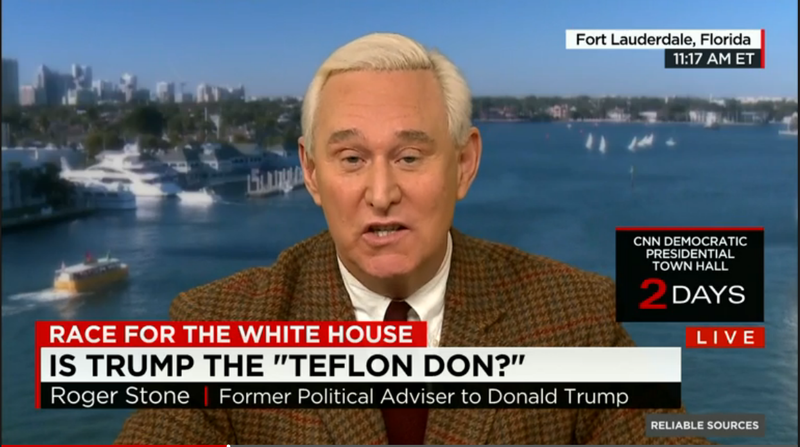 In February, CNN announced that it had banned Donald Trump surrogate Roger Stone from its airways. This week, MSNBC similarly banned Stone, which was revealed when they cut out an interview that Bloomberg’s With All Due Respect did with him — which MSNBC re-airs an hour later. Media Research Center President Brent Bozell said, “CNN and MSNBC should be applauded for banning Roger Stone from their airwaves. Stone’s recent threats to intimidate delegates at the Republican Convention by broadcasting their hotel rooms and his long history of incendiary and offensive rhetoric add no value to the national discourse. Agree with them or not, Trump’s surrogates are fine people. But Stone is a thug who relishes personal insults, character assassination, and offensive gestapo-like tactics that should be unequivocally dismissed by civil society, most especially those who might give him a platform from which to spew his hatred.